It doesn't get more intense than this one. 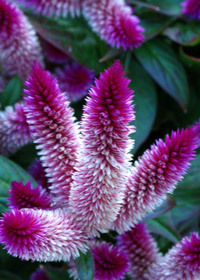 The electric magenta 'plume' atop the deep green foliage of this Celosia adds an exotic and tropical effect to any garden setting. Truly one of the most unique summer annuals you will find.